All future dairy veterinarians are born and raised on an American dairy farm, right? Charles and Daryl Nydam, father and son and coordinator and director, respectively, of the Summer Dairy Institute at Cornell, have seen people with a diversity of backgrounds attend the institute. In the 10 years the institute has been offered, the Nydams have seen a computer engineer, a nurse who served in the U.S. Navy, an author and even a West Point graduate who flew Blackhawk helicopters in Afghanistan on a tour of duty, all focusing on a future career as a dairy veterinarian in addition to the many who have a more typical background. The Summer Dairy Institute is an advanced training program for prospective veterinarians specializing in the dairy industry. The intensive six-week course covers subjects such as data-based decision making, reproduction, nutrition, foot care and calf management, taught by renowned experts. Students have the opportunity to learn the course material through a combination of lectures as well as off-site hands-on experiences. Directors Drs. Chuck Guard, Rob Gilbert and Daryl Nydam dreamed up the institute together 12 years ago. They recognized a need to fill an educational void in the beginning stages of a dairy veterinarian’s career. By bringing experts from their respective fields, the training could accelerate the young veterinarian’s entry into the rapidly progressing dairy industry. “The Summer Dairy Institute will complement the knowledge young veterinarians gain in vet school with a more progressive dairy management style,” Daryl Nydam says, noting that is the first goal of the program. The second goal of the institute is to accelerate their careers as dairy veterinarians. With the knowledge gained, the veterinarians will provide higher value services to the modern dairy industry sooner in their careers. And finally, the institute aims to create a network of like-minded, young veterinarians so that they can have a collegial resource to call upon from all different regions of the world. 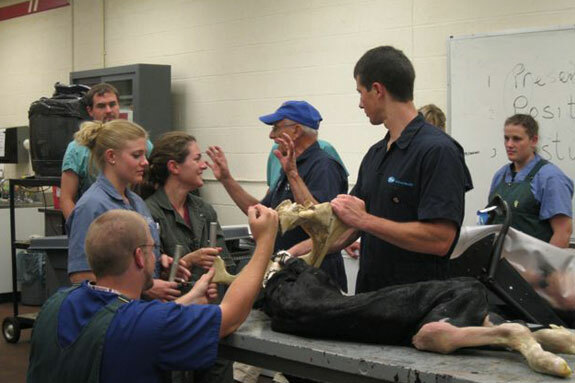 This year marks the 10th anniversary the institute is offered to veterinary students and the largest class the institute has ever had with 30 students. Within the past 10 years, 213 alumni from 30 North American veterinary schools have participated. Alongside them, 12 international students from Spain, Portugal, Austria, the United Kingdom, the Netherlands, New Zealand, Denmark and Germany have also greatly benefited from the institute. “Alumni say it was a valuable experience, well worth the time and money invested,” Chuck Nydam says. “They still refer to the notes from the institute, even a few years out.” Many alumni have even said that when hiring new dairy veterinarians they require the young vets to participate in the institute before starting their career. The feedback received from previous participants is a great factor in deciding what material is taught in succeeding years. Evaluations from current participants at the end of each summer as well as veterinarians already in the field help determine what the curriculum will look like each year. Dr. Tom Overton, a Cornell University professor and one of the institute’s instructors, teaches the dairy nutrition component of the program. This part covers general dairy nutrition ration formulation, nutritional management and some milk component trouble shooting. Although the students receive a lot of information in a short amount of time, they gain “a well-rounded exposure to modern herd dairy management, exposure to different components and exposure to a network,” Overton says. 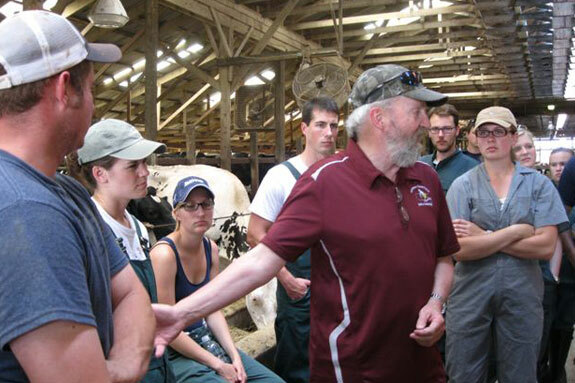 Upon his return for his third year in vet school, Howell switched his emphasis to be a dairy vet. Only two other students at the veterinary school in Georgia were specializing in dairy, so Howell has enjoyed spending time with so many other institute students who are also interested in dairy medicine. Howell has especially enjoyed the location. Being close to many well-managed dairies, in the Finger Lakes region of upstate New York, has greatly aided in the education the students are receiving. Fortunately for Howell, he already has a job lined up upon completion of the institute. Howell will be joining Countryside Vet Clinic in Lowville, New York. Although students arrive to the Cornell Summer Dairy Institute with different backgrounds, they leave with a common purpose: to be future dairy veterinarians and to fully immerse themselves in the dairy industry. 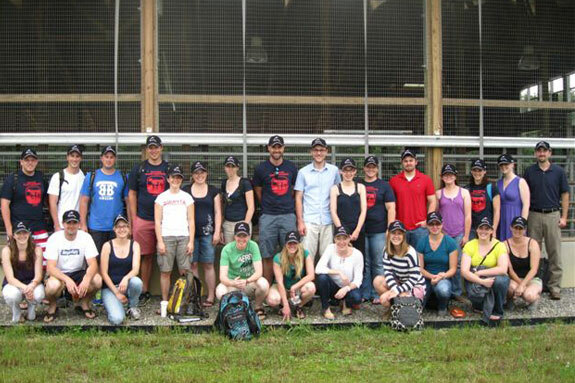 Students in the Summer Dairy Institute program at Cornell learn about careers as veterinarians. Photos courtesy of Charles Nydam.